Workplace safety became a national mandate when Congress passed the Occupational Safety and Health Act of 1970. This law created the Occupational Safety and Health Administration, or OSHA, within the U.S. Department of Labor and made employer record keeping and reporting integral to data collection for OSHA's mandate to analyze and address on-the-job injuries. All private-sector employers must notify OSHA of work-related fatalities, severe injuries, amputations and eye losses. Not every hospital admission is reportable. 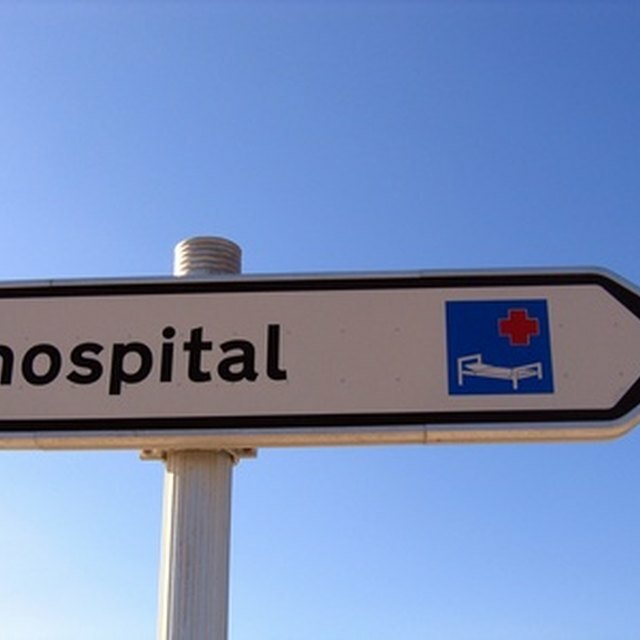 OSHA defines in-patient hospitalization as admission for treatment or medical care, not observation or testing. An employee who fell from a ladder while arranging merchandise and spends the night in the hospital so doctors can monitor him for concussion symptoms does not create the need to call OSHA. However, if that same employee suffered internal injuries and was formally admitted as a patient within 24 hours of falling, his employer has 24 hours after being apprised of the situation to report the incident to OSHA. Amputations from OSHA's perspective include arms, legs, fingers or toes severed by machinery and those surgically removed due to irreparable damage. Lost fingertips also fall under OSHA's definition of amputation even when no bone was involved, as does any partially or totally severed body part that doctors reattach. Blindness as a work-related injury does not constitute a reportable incident, unless it results in the employee being admitted to the hospital for treatment and becomes an in-patient hospitalization. For OSHA reporting purposes, loss of eye means the employee’s eyeball was removed. To comply with OSHA's reporting requirements, all employers must be mindful of precisely when an incident that causes death, amputation or eye loss happens. They must alert OSHA of any employee death occurring within 30 days of the job-related incident that led to it. After becoming aware of the death, employers have eight hours to tell OSHA. If the employee dies 31 days after being hurt performing her job, her death is not OSHA reportable. The reporting window is 24 hours when an accident at work results in an employee undergoing an amputation or losing an eye. For example, an amputation done six weeks after the accident isn’t required to be reported. An employer also must watch the clock after learning about the employee’s condition. OSHA wants to be informed no more than 24 hours of the employer getting the news. The 24-hour deadline also applies to the fourth type of reportable event: in-patient hospitalizations associated with a work-related incident. As of the publication date, employers have two ways to advise OSHA of a reportable incident, although OSHA has announced plans to offer online reporting. Call the OSHA toll-free number: 800-321-OSHA (6742). OSHA also will need the organization's name plus a phone number for and name of its designated contact person. Employers in any of the 27 states or territories with their own OSHA-approved occupational safety and health program report this same information directly to their state plan.